Signs outside stations direct people with disabilities to use wheelchair ramps to access the station. 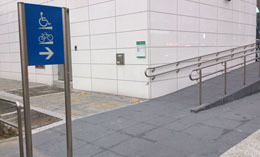 To lead the visually impaired to the station entrance or elevator. 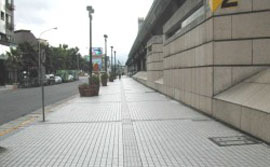 However, in line with Taipei City Government’s policy, tactile guide paths for the visually impaired were not installed anymore on the sidewalk outside stations that commenced service after 2008. 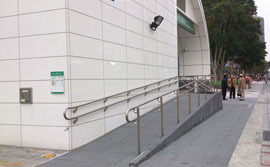 Wheelchair ramps are installed for people with disabilities to enter the station safely. 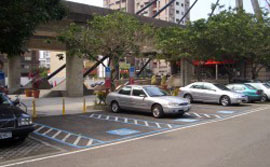 Parking for the disabled is offered at all metro station parking lots. The spaces are located near the main entrance to the station.